The Clément's X'Plor USH is a quick rolling tire that's equally at home on dirt roads or smooth tarmac. It's named in honor of Ushuaia on the island of Tierra del Fuego, Argentina, the southernmost city in the world and the ultimate destination for adventure bike touring. Unlike the more aggressive MSO Adventure tire, the USH features a nearly smooth center tread with tightly spaced firm chevrons. This design allows the tire a virtually unimpeded roll on paved surfaces without giving up grip on rough road. Short diamond side knobs increase the USH's traction on dirt and grass. The result is a tire that's adventure ready with minimal sacrifice in speed. This version of the Clément X'Plor USH features a 60 TPI casing and dual compound tread. 65-90 recommended PSI. Wire bead. 700c x 35mm (35-622 ISO). 430 grams. Purchased these tires for my XC MTB to do a 2 day, 150 mile rail trail trip (Great Allegheny Passage) in Oct 2017. Wow did these tires perform well. Funny part is a fellow-traveler, friend and long time cyclist showed up with the exact same tire for the trip and we had not spoken. We both agreed these tires were phenomenal for this trail (hard pack, finely groomed gravel and paved) and were the perfect balance between low rolling resistance with plenty of grip. Clement quality speaks for itself but these were especially great. Highly recommend. Great for my mix of gravel, crushed stone and pavement. I bought these because they looked like they would be nice for my mix of riding on a Trek 7.3 FX. I ride mostly crushed stone, with some gravel on the rail trails, and some road riding. These are sure footed on the trail, and roll well on pavement. I am a very large rider, so I wanted something a little wider than the stock 32 mm tires, and also preferred a tire with some tread for the trails. These have handled my trail rides real well, and I rode 32 miles in the Tour de Scranton charity ride, and the only thing that kept me from staying with other riders was my fitness level and weight. I did hit a few pot holes with the sad road conditions in my area, and even got the front tire caught in a 2 wide rut when I took a little spill, and the tires held up to it all without any issues. Even though I was somewhat hesitant to inflate to 90 psi, I decided it was the best due to my weight... the tires ride quicker, and don't seem any harsher than the 40 mm tires I had on the bike before I put these on, and I was running them at about 70 psi. This is a nice smooth riding set of tires. When they wear out, I will probably try out the 120 tpi version. 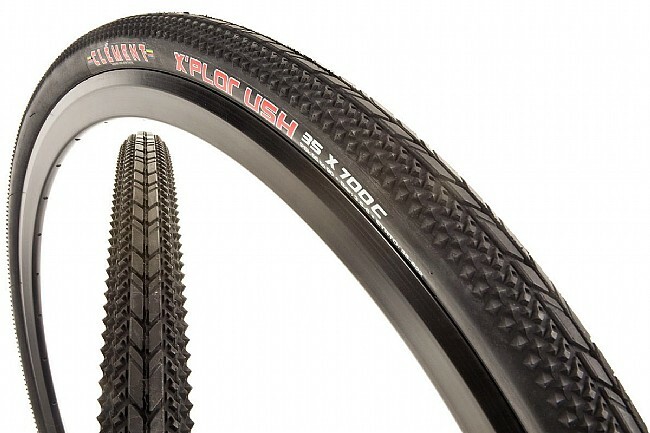 Great tire for urban assault cyclocross tire. I ride paved and gravel trails so it works for both. It is a fast tire, with a cyclocross bike i am able to catch to road racers and keep up with them. If it's wet the tire handles well and feels secure, going on grass trail or light mud it keeps traction. The rear tire a have about 1000mi without a flat. I recommend these tires as a great over all tire if you can fit them on your bike. I ride these on gravel and tarmac with a lot of climbing on both. Tires work great on both even at max psi in the gravel. I was using Fremont Freedom Riders which I liked because of the smooth ride. The USH's were a lot smoother than I anticipated. I inflated the Freedom Riders to 60 psi and I inflate these to 85 but it was barely noticeable as far as smoothness. These tires feel much faster and they have a great grip on all surfaces. I have these on my CX bike. I ride this bike everywhere - roads, dirt, etc. These have low rolling resistance for pavement and decent traction for dirt roads. Tread lasts a long time. I ride in the city with occasional off road action. I like these tires cause they have a decent amount of rubber in the center for fast road riding and are able to fight off bigger objects that cause punctures. With the aggressive looking diamonds on the sides it will still give good traction in lighter soil or grass. I use this tire to get out of the city (where I live) and into the country where the beautiful landscapes and dirt roads are. The smooth center ridge of the tread minimizes rolling resistance on pavement while the small pyramids on the shoulders give me decent traction in the dirt. The tire volume is enough cushion when the roads or trails are rocky and rutted. And the surface area is enough to float over loose sand. These tires are not perfect for any surface. But they are ideal for the mix of surfaces that I encounter on the long mixed-surface rides I like to do.